The ShopAbility team examines how the path to purchase is changing with the rise of digital technology, and opportunities this presents, for National Liquor News. In previous NLN articles we have alluded to the changing purchase cycle and how shopping is becoming an activity, rather than a place. And the high degree of smartphone penetration in Australia (second in the world, and nearing 60%). Here we’re going to provide an overview of some of the key technology types for both transacting and marketing, which will be explored in more detail in subsequent articles. Technology advances are changing shopping behaviour and the purchase cycle. They are democratising information and resulting in a higher level of pre-store planning, meaning retailers can’t just rely on chance footfall. The higher degree of pre-planning means it is also becoming harder to interrupt shoppers instore. Technology is providing shoppers a means to broadcast their satisfaction – or otherwise – with their shopping experience and product purchase via social media. Technology is providing the means to shop anywhere, anytime, 24/7. And these changes are not temporary, they are permanent, if evolving rapidly. For retailers and brands alike, it is no longer about weathering the ‘current storm’. It is about evolving the entire way you do, and think about, business. However, technology shouldn’t be considered as scary, or online ‘replacing’ bricks and mortar sales. Rather, technology should be embraced as a tool to speak to shoppers where and when they want to have a conversation or transact with you. Technology provides additional means to capture a sale. Technology is just as relevant to retailers as it is to brand marketers, suppliers and manufacturers. ‘Going forward’, as our erstwhile PM Julia would say, it’s going to be all about how you best provide shoppers with a seamless omnichannel brand and transaction experience. HOW IS TECHNOLOGY CHANGING SHOPPING BEHAVIOUR? Understanding the path the shopper takes to make a purchase and the way digital technology can change this behaviour will help you to market your store and products in a way that meets their needs and drive incremental sales via targeted inititatives. Understanding the impact of technology will also help you to speak to the shopper when and where they want to have a conversation with you. While early shopper marketing theory suggested that the path to purchase occurred predominantly instore, the widespread use of technology designed to assist the purchase process means that this is no longer the case. The shopper exists before the store, in the store and even post store. We will cover this in more detail in future articles, but in this one we will focus on the technologies and how they can be used. The possibilities are endless. The opportunity lies in uncovering which touchpoints along the path to purchase will best speak to your shoppers and then use them to your advantage to market your store or products. 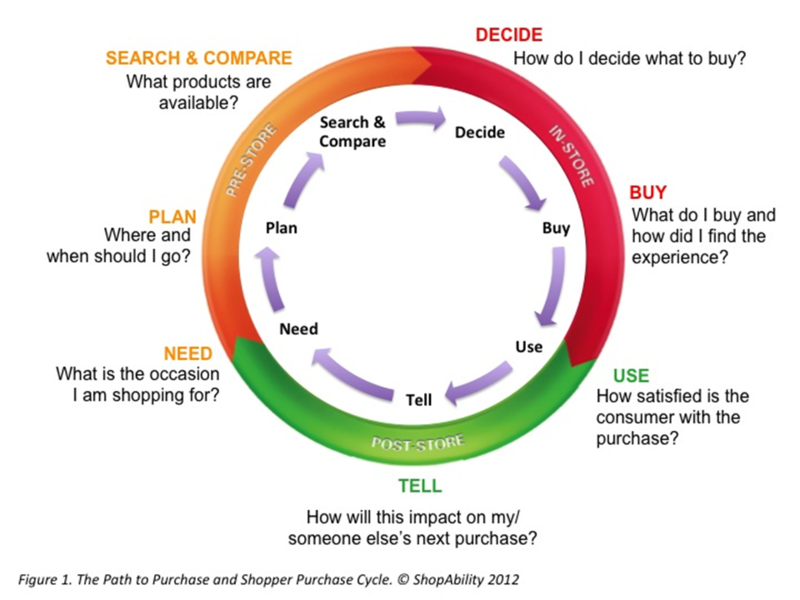 The diagram below demonstrates not only the path to purchase but also the phases of the shopper purchase cycle shoppers go through to obtain products and services. Many of these phases may be subconscious and may also be impacted by the way the shopper views the category. The level of involvement a shopper has with a category will influence how they progress through the shopper cycle. For example, take a wine buff versus someone who has limited experience or knowledge of wine. The wine buff is much more likely to give greater consideration to where they go to purchase and will potentially search out rare wines or research particular grape varietals. The shopper with limited wine experience may choose their store based on convenience rather than range and rely on store staff, POS or wine show ‘medals’ on the packs to help them make their decision instore. In this case, their level of experience with the category and level of engagement determines how they behave throughout the purchase cycle. Understanding your shoppers and knowing how they behave along the cycle will help you to determine how you should invest your marketing dollars. So, how are shoppers using technology to shop? Let’s look at just some of the technology that is changing the way products can be marketed, information can be provided or obtained and sales are transacted. Some are obvious, others are newer, emerging technologies currently being used in retail markets around the world. We’ve divided these roughly into Transacting technologies and Marketing technologies, but there are areas of overlap. Shopping is now an activity that can occur instore, online, or indeed anywhere via transaction codes (see Figure 2 below). Buy anywhere via mobile (eg off a bus shelter or virtual shopping wall in a train station) and have it delivered home. The idea is you need multiple ways to capture the transaction. Just relying on search instore/buy instore is not enough. You need to shore up the sale, however the shopper wants to make it. We’ve all heard about the rise of online shopping and while currently the percentage of total sales taking place online (currently <15% of total Australian retail) are relatively small there is no doubt that it is a growing trend. The categories driving this trend are music (think iTunes), movies, books and fashion. At this stage, food and beverage (including liquor) sales transacted online are minimal, under 5%. This doesn’t mean that it is not an area of opportunity. Nor does it mean that the rise of online shopping will spell the demise of bricks and mortar retail. There is no doubt that the major retailers have begun working on their online offer. Dan Murphy’s have launched their online shopping site, as have Liquorland. We leave it to your judgement whether these are good offers but We definitely suggest you look at what your competitors are offering and think about how you might compete. Many shoppers are not interested in shopping online, however online stores may still have a part to play in the purchase process. Having these sites in place will help a shopper who is researching a product they wish to purchase. They may use the site to gain more information about a new spirit they have heard about or to understand if this product is ranged in a particular store. This demonstrates the dual purpose of establishing an online offer. Many of you will have heard of ‘showrooming’ which talks about shoppers who research instore and then buy online but this is significantly less than the number of shoppers who research online and buy in bricks and mortar stores. An online offer can compliment your current bricks and mortar store. It is not something you should be concerned will undermine your current offer…unless you don’t do it and all your competitors do! The other type of online store to keep an eye on are online auction sites such as Gray’s Online. While there are only a small number of shoppers who might look to purchase via auction they do provide another option for shoppers considering alternative channels. Online retailing has, up until now, largely been driven by range and price. 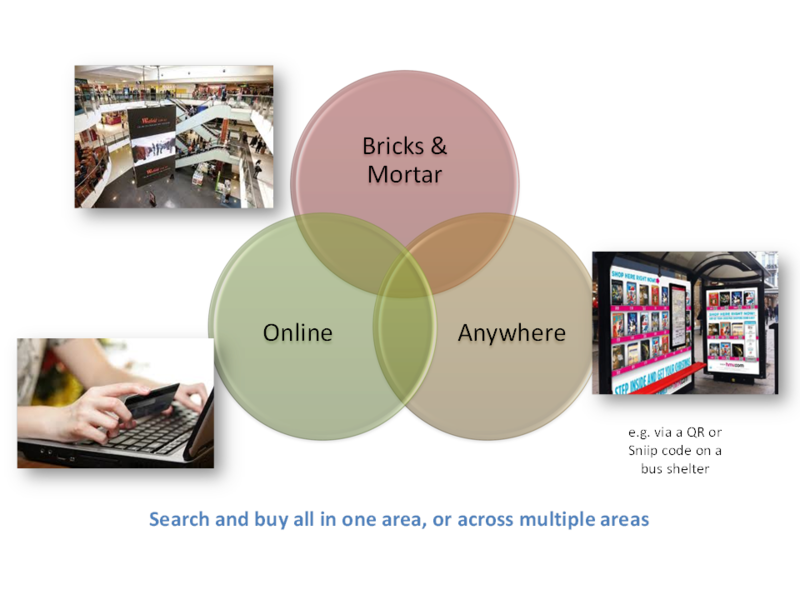 This begs the question, what does the role of bricks and mortar stores become? And the answer is, experience and service. Drive the showroom experience! You need to provide reasons for shoppers to visit your store other than having known brands at reasonable prices. That is now the cost of entry, not a point of difference. 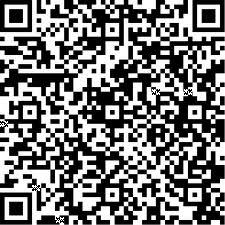 Heard of QR (Quick Response) codes yet? Those small black and white barcode-like devices made up of small squares. When scanned with a QR code reader (which can be downloaded free onto mobile devices) these codes provide shoppers with access to value added content, more information on a product or brand or access to purchase a product online. Codes such as QR, Digimark, Viewa etc are not restricted to valued added content. They can also provide shoppers with the ability to purchase anywhere, anytime. Imagine a bus shelter with an advertisment for a new brand of beer. The advertisment has a code in the corner. When this code is scanned it directs the person to a mobile purchase site allowing them to purchase the product and have it delivered to their home. One example of this type of code is a Sniip code which does exactly that. As a retailer, this gives you the ability to attract shoppers anywhere, anytime if you have the back-end ability to process the transaction and make the delivery. You are no longer restricted to selling within the confines of the four walls of your store. You can speak to shoppers on the go. Heineken is just one example of an alcohol brand using QR codes to add value. During the last Rugby World Cup they offered their shoppers and consumers access to a free rugby themed game when they scanned the QR code on the back of their bottle. How about Augmented Reality? Augmented Reality mixes virtual characters with the actual world distorting (in an entertaining or informative way) the viewer’s perspective of the real world. Coopers Clear Cut used AR in a promotion that offered shoppers the chance to win a diamond. It also gave Coopers the chance to speak directly with their shoppers (via Facebook) and share information about their brand in a fun and entertaining manner. And it reduced the need for instore POS. The number of codes and techniques is growing. Take the time to look at a Pacific Magazines publication to see their new Genie application that provides their readers with value added content, ACP’s version called Viewa, or even codes like Airlink used for valued added content by the Sydney Morning Herald. These types of codes are only going to continue to grow in popularity as a means to communicate either pre or post store with shoppers and consumers – both through value added content and through promotions and ability to transact. Shoppers Stop (the equivalent of David Jones in India) has been using Augmented Reality catalogues for nearly 12 months, allowing shoppers to scan ads in print media and be taken to their online catalogue that contains additional ‘secret’ offers in the augmented reality content. Ikea recently announced the launch of its augmented reality catalogues for 2013. Augmented reality and mobile codes can also be used post-store. For instance, Gatorade’s G Series Fit provided shoppers with custom video workouts only available on mobile/online with proof of purchase. An up and coming area to watch is that of Near Field Communications (NFC). Paypal have just launched an NFC based mobile payment system. NFC allows you to do ‘Location Based Marketing’, that is, to market (provide offers) to people who are in the immediate vicinity of your store or of a specific product or category. There is no denying that social media sites such as Facebook, Twitter and even Pinterest (the new kid on the social media block) are impacting how shoppers make decisions on the products and services they buy. More people seek advice from trusted peers by surveying their friends and/or followers via social media than trust what a retailer or manufacturer says. These social media sites also provide an opportunity for shoppers and consumers to share their opinions and experiences of different products and retailers. What are your shoppers saying about you on Facebook? Alcohol brands are also using these social media platforms to communicate with their consumers and shoppers. Take Swedish cider brand Rekorderlig which is a relatively new entrant into the cider category. They recently celebrated the fact that they now have 100,000 fans on their Australian Facebook Group. That’s 100,000 loyal consumers they can speak to directly whenever they choose to. How does this impact retail? They’re telling their loyal fans which outlets are stocking their products and driving traffic to stores and bars who are supporting their products. Social media is not just about broadcast and brand building. Importantly, it can (and should) be used for driving repeat purchase, such as ‘Like us on Facebook and receive x% off your next purchase’ (a digital discount coupon is enabled once the user has ‘liked’ you). These technologies are just a sample of the digital technologies available to shoppers to assist in their purchase process whether it be driving their choice of product, store choice or influencing others via word of mouth through social media. All of this means you have a plethora of new opportunities to reach and repeatedly communicate and transact with your shoppers, both within and outside the bounds of the store. Who are your shoppers and how would they like to engage with you, your store and your brands? How can you use technology to reach them in an increasingly connected and tech savvy world?